The Class of 1968 celebrated their 50th reunion and were inducted into the Golden Oaks Society at a luncheon on May 18. In her remarks, President Jo Allen, ʼ80, reminded alumnae of what Meredith was like during their time on campus, including how the class prevailed at Cornhuskin’ and Stunt. During the Class of 1968’s senior year world and state events included the civil rights movement, the Vietnam War, and in politics, the country was preparing for a presidential election. Otis Redding’s Sittin’ on the Dock of the Bay, the Beatles Hello, Goodbye, and Hey Jude, and Simon and Garfunkel’s Mrs. Robinson were the songs to remember. Allen concluded with a list of impressive careers from the Class of 1968. After reciting their oath, President Allen gave each alumna a pin as a symbol of their membership to the Golden Oaks Society. Friday evening all classes celebrated together in Belk Dining Hall and enjoyed music from the Entertainers in the courtyard. Saturday morning began at 7 a.m. with a brunch and Royal Wedding viewing party in Belk Dining Hall. Later in the morning, alumnae awards were presented by Amanda Steele Johnson, ʼ96, president of the Meredith Alumnae Association, and President Allen presented the philanthropy awards and gave a State of the College in Jones Auditorium. President Allen’s talk covered issues in higher education, perceptions about private colleges, as well as a Meredith College update that included enrollment, facility enhancements, athletic accomplishments, marketing efforts, and a Beyond Strong │ The Campaign for Meredith update. Erin Cleghorn, director of The Meredith Fund, gave an annual giving report to each class and introduced Judy Woodruff, ʼ68, anchor and managing editor for PBS NewsHour and honorary co-chair of the Beyond Strong Campaign to give a campaign update and reflect on her 50th reunion. Class meetings were held that afternoon and on Saturday evening individual classes held activities. The weekend concluded Sunday with a worship service in Jones Chapel. Phyllis Trible, ʼ54, one of the career achievement award recipients, delivered the sermon. The service was followed by a brunch. Congratulations to this year’s alumnae and philanthropy award recipients. Read more about this year’s recipients below. For three decades Americans have watched Judy Woodruff, ’68, on television interviewing countless world leaders, politicians, and influencers. After beginning her journalism career in Atlanta, Woodruff was named White House correspondent for NBC News in 1976. She joined PBS in 1982, where she continued White House reports for the nightly news program the PBS NewsHour. She moved to CNN in 1993 to host Inside Politics and CNN WorldView. Woodruff returned to PBS in 2005 and the NewsHour in 2006. In 2013, she and Gwen Ifill were named official anchors of the PBS NewsHour. She is now the sole anchor and managing editor for PBS NewsHour. Woodruff currently serves as the honorary co-chair for Beyond Strong | The Campaign for Meredith. She also served on the Campaign Planning Committee for the Campaign for Meredith. Woodruff is a member of the Stringfield Society, Heritage Society, Thomas Meredith Society – Silver Level, Iris Society – President’s Circle, and Onyx Society. She supports the Judy Woodruff Scholarship Endowment Fund to provide support for students in northeastern North Carolina, and established a planned gift, the Judy Woodruff Travel Endowment, to provide scholarship support for students studying in Asia, Africa, The Middle East, South America, or Central America. As a student and alumna of Meredith College, Christina Cole Spears, ’13, ’14 (MAT) embodies what Going Strong means and demonstrates it daily in her many roles at the College and in her work. Since graduating, Spears has served on the Young Alumnae Board for four years and the Alumnae Association Board of Directors for three years. As the event agent for her class, she has coordinated activities for their first class Reunion and you can always find her at Homecoming, Alumnae Reunion Weekend, Discover Meredith, and admissions events. She is also a member of the Onyx and Ivy Societies. Since graduating from Meredith, Spears has worked at Centennial Campus Magnet Middle School, Panther Creek High School, and as a special education teacher at Apex Friendship High School. This year, she co-taught an education course at Meredith. She recently began a new position as special assistant to the Wake County Public Schools assistant superintendent for equity affairs. Last year Spears received the Technology in Teaching Award given by the Cary Chamber of Commerce and SAS. Lynn Dodge, ’68, was loyal to her class and was actively planning the 50th reunion for the Class of 1968 when she passed away in September 2017. Her loyalty was always evident to her class as well as her co-workers throughout her career. Dodge returned to her hometown of Lynchburg, Va., six years after graduating from Meredith College to serve as the director of Lynchburg Public Library. She held this position for 39 years until her retirement in 2013. During her four decades at the Lynchburg Public Library she drafted the master plan for the future of the library, oversaw the move of the library, launched an outreach program where library staff would take books to the young and elderly, and was involved in the establishment of the Center for Human Rights within the library. The Lynn Dodge Story Time Room in the Lynchburg Public Library is a permanent reminder of Dodge’s commitment to the children of Lynchburg. Dodge was a supporter of Meredith College who served as the permanent Class President through many reunions. During the College’s 125th anniversary she worked to engage her class in the celebration. Phyllis Trible, ’54, has been a strong advocate for women in theology. She is an internationally known biblical scholar, rhetorical critic, and considered a leader in the text-based exploration of women and gender in scripture. After graduating with a religion degree in 1954 from Meredith she attended Union Theological Seminary in New York and eventually earned her Ph.D. in 1963 from Columbia University. In 1998, Wake Forest University School of Divinity hired its first faculty members. Trible was appointed by the Board of Trustees as an associate dean and professor of biblical studies and from 2002-12 was a university professor at Wake Forest University. Her professional experience led her to many places such as Union Theological Seminary, N.Y., Andover Newton Theological School, M.A., Albright Archaeological Research, Jerusalem, and 14 visiting professorships spanning 50 years. Trible has lectured abroad at numerous colleges, universities, seminars, and international gatherings and in the United States has lectured at more than 400 academic institutions and numerous churches and civic groups. She has written seven books and written 74 articles for publications from 1967 to 2015. Nancy Cheek, ’63, had parents who believed that one should give back in gratitude for what has been given to them. Cheek’s mother, Vida Williams, ’37, attended Meredith and her father, Fred, served numerous terms on the Meredith Board of Trustees from 1960-2004. He was an avid fundraiser and friend-raiser for the College. To honor his wife he established the Vida Thompson Williams Scholarship. Cheek has continued to support that scholarship and in 2014 established the Williams Cheek Faculty Development Fund. She wanted a way to say “thank you” to the professors who believed in her. Cheek, a member of the Board of Trustees, graduated from Meredith College in 1963 with degree in English and an Elementary Teachers Certification. She earned her Master of Education from UNC-Chapel Hill in 1967. Cheek was an elementary school teacher for 28 years. She has served on the Meredith Alumnae Board and on the Board of Associates. During numerous terms on the Board of Trustees, she has served as vice chair and chair of the Board. Jenny Lynn Miller Tolson, ’78, has an appreciation for and loyalty to Meredith College for the nurturing environment it provided her. Tolson’s respect for the College led her to pay it forward with a planned gift that will ensure students continue to go strong. Tolson majored in American civilization and also received her K-8 language arts and social studies license at Meredith. Upon graduation she attended East Carolina University and earned a master’s in learning disabilities. She retired six years ago, after a 33-year career in special education near Charlotte, N.C. Her career gave her great enjoyment knowing she was positively affecting the lives of people, and now her planned gift to The Meredith Fund Endowment will do the same for Meredith students. Tolson wants to extend the wonderful education and lifelong friendships she gained at Meredith to future students. By partnering with the College she was able to decide what her gift should support and to honor what she was given at Meredith and create a better future for generations of Meredith students. 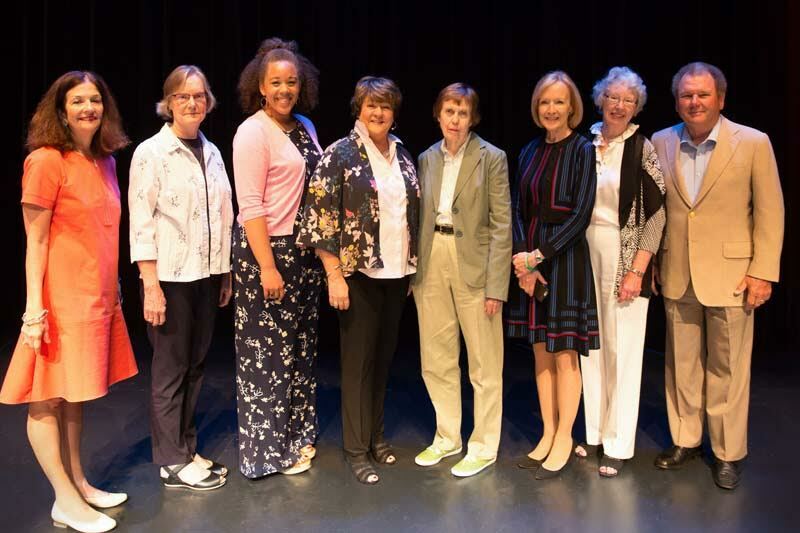 Photo shows left to right: Jenny Miller Tolson, '78, Laurie Dodge Hibbert, '72, accepting the award in memory of her sister Lynn Dodge, '68, Christina Cole Spears, '13, President Jo Allen, '80, Phyllis Trible, '54, Judy Woodruff, '68, Nancy Williams Cheek, '63, and David Williams.